Tonight (Feb. 15), skywatchers may be rewarded by a dazzling atmospheric show ­ — thanks to a halo of radiation that blasted from the sun on Monday (Feb. 12). A minor geomagnetic storm has just settled over Canada and the northern United States, according to a news alert from the National Oceanic and Atmospheric Administration (NOAA) Space Weather Prediction Center — and it could result in visible aurora borealis in some states tonight. The aurora can most likely be seen north of the Canadian border, NOAA said, but could appear in the night sky as far south as northern Maine and Michigan. Why do solar storms cause auroras? Auroras in the Earth's Northern Hemisphere, also called the northern lights, periodically glisten in the night sky thanks to solar activity like the storm headed our way. But why? The reason begins about 93 million miles (150 million kilometers) away, on the surface of the sun. The sun's surface is a tangle of superhot, constantly moving gases that generate huge, powerful magnetic force fields, according to NASA. (The magnetic field can be described by magnetic lines, which map the direction and strength of the magnetic field at any location.) The regions where these magnetic forces are the strongest form sunspots, which are volatile, visibly darker patches on the star's surface. If the magnetic lines near these sunspots become too tangled, they can burst into eruptions of radiation known as solar flares. These flares may also be accompanied by huge belches of radiation and particlescalled coronal mass ejections (CMEs). "These coronal mass ejections are a big blast of up to a billion tons of plasma gas," which brings with it a huge magnetic field, Bill Murtagh, a program coordinator at NOAA's Space Weather Prediction Center in Boulder, Colorado told Live Science. "And they’re usually traveling at about two to three million miles an hour." These incoming solar storms are usually little cause for concern here on Earth; the planet is constantly being bombarded by radiation, magnetic waves and other charged particles from the sun. Earth's own magnetic field — an invisible shield generated by electric currents emitted from the planet's outer core — deflects most of these particles and protects the atmosphere from harmful ultraviolet radiation. However, during a CME (like the storm headed our way), charged particles can travel down the magnetic field lines at Earth's north and south poles and enter the atmosphere. 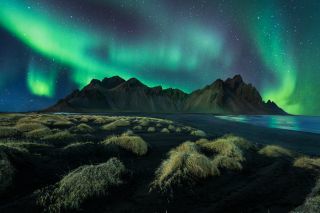 "Depending how the CME and the Earth’s magnetic field couple, those energetic particles will come flowing in, penetrating into the atmosphere and striking the atoms and molecules in our atmosphere," Murtagh said. "Those energetic particles excite the atoms in our atmosphere [like oxygen and nitrogen], stripping electrons away from them, and that causes them to light up." And so, the northern lights streak across the sky. The colors you'll see depend both on the type of molecule being struck and their altitude; oxygen gas, for example, tends to glow green at low altitudes (up to 150 miles, or 241 km)and red at higher altitudes. The gorgeous result can often be seen with the naked eye and captured with most standard cameras. If you live far enough north to see it tonight, enjoy the interstellar show.